Research at the Great Lakes Center focuses on the ecology and ecosystems of the Great Lakes and their tributaries.  GLC research scientists, affiliates at Buffalo State, and collaborators from other institutions bring diverse areas of expertise to the Great Lakes. Such expertise enables scientists to provide policymakers with information, which in turn promotes more informed decisions about ways to protect water quality, support the survival of native species, manage nuisance invasive species, monitor carcinogens in the food web, and many more. Research also contributes to scientific understanding of the complex interactions that occur in aquatic ecosystems around the world. Much of the research done by GLC scientists is carried out from the Field Station and focuses on aquatic ecology and ecosystems. 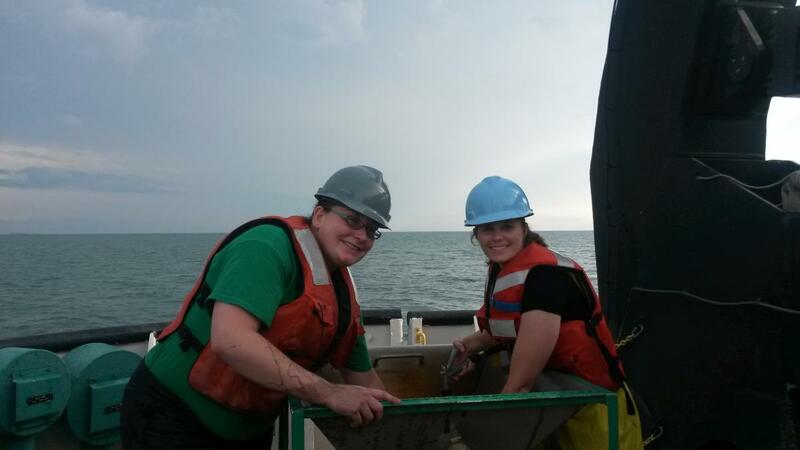 This includes large multi-agency studies of Lake Erie as well as graduate and undergraduate research projects. 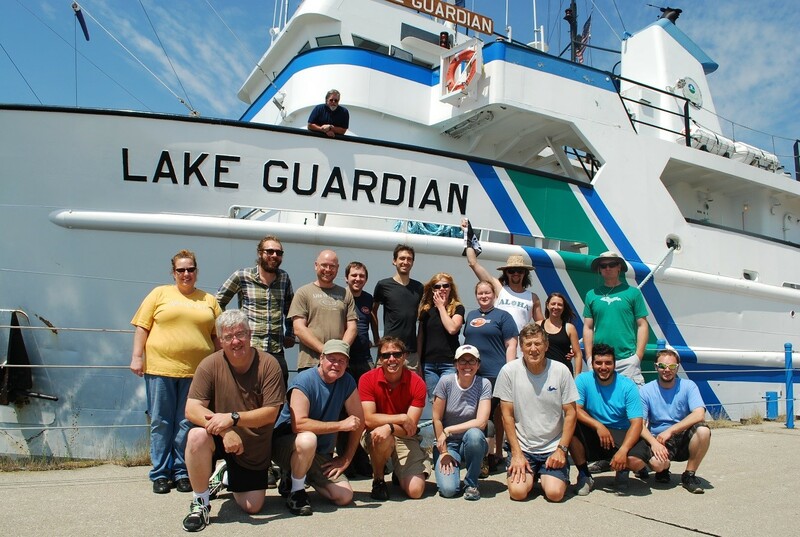 The Great Lakes Center has several monitoring efforts ranging from a continuously monitoring buoy, to a biweekly lower trophic level sample in Lake Erie, to an intensive benthic sampling trip that spans all five Great Lakes. Some of our research focuses on conservation of threatened freshwater species. Sasha Karatayev and Lyubov Burlakova are working on projects aimed at identifying threatened populations and genetic diversity of native freshwater mussels in Texas. We also completed a project aimed at understanding the habitat use and feeding ecology of the lake sturgeon in the Lower Niagara River. The Great Lakes Center conducts research to study the effects of species that have already invaded the Great Lakes and their tributaries, as well as to identify species which have the potential to invade. Species of interest include zebra and quagga mussels and their parasites, round gobies, alewives, and Hemimysis anomala. The EPA Monitoring Program is designed to provide managers access to biological data on zooplankton and benthos to support decision-making. In collaboration with Cornell University, we collect benthos (Buffalo State), zooplankton, and chlorophyll data (Cornell University) across the five Great Lakes from 2012 to 2020, analyze this data and make it available to environmental and fisheries managers. Additional research projects include evaluation of early detection system for invasives, creating a barcode library for native benthic invertebrates in the Great Lakes Region, and development of biotic indices of ecosystem health based on benthic invertebrates. The project will be conducted in association with the Cooperative Science and Monitoring Initiative (CSMI) years in each of the Great Lakes. Benthic data collected in 2012-2017 have been submitted and approved by the U.S. EPA Great Lakes National Program Office. Based on these data, we have made 39 presentations at various meetings and conferences and published one paper in Limnology and Oceanography and 8 more papers in the Journal of Great Lakes Research. These publications were part of the Special Issue of the Journal of Great Lakes Research (Guest Editors L. Burlakova, A. Karatayev, L. Rudstam, and E. Hinchey) "U.S. EPA Great Lakes National Program Office Long-Term Monitoring of the Laurentian Great Lakes: approaches, achievements and lessons learned." Published August 2018 (18 papers total). Some of the publications and reports of the 2014-2016 CSMI benthic surveys are available on the Publications page. We are using data collected during the last two decades of Great Lakes benthic monitoring conducted by the U.S. EPA’s Great Lakes National Program Office to describe the spatial and temporal patterns of benthic communities, assess their status, trends, and main drivers, and to infer the potential impact of these community changes on ecosystem functioning. Analysis of temporal trends revealed that the largest changes occurred in profundal communities, apparent in significant shifts in dominant taxa across all lakes except Lake Superior. In lakes Michigan, Huron, and Ontario, the former dominant Diporeia was replaced with Dreissena and Oligochaeta. Profundal species, with the exception of dreissenids, became less abundant, and their depth distribution has shifted. In contrast, density and diversity of native littoral and sublittoral communities increased. The invasion of dreissenids was among the most important drivers of changes in benthic communities. Continued monitoring is critical for tracking unprecedented changes occurring in the Great Lakes ecosystem. Please find paper summarizing the results of this analysis (Burlakova et al., 2018) on the Publications page. During the last 50 years the ecosystem of Lake Erie has experienced major environmental changes, from anthropogenic eutrophication in 1930-1960s, to nutrient and pollution abatement in the 1970s, and then the introduction of exotic dreissenids in the 1980s. Currently the lake-wide benthic community is dominated by dreissenids. The number of exotic species found in benthic surveys increases every decade, from one in 1963 to ten in 2009-2012, and the majority of the invaders were molluscs. Whereas the role of benthic invaders in community diversity is still low, their impact has had enormous consequences for the whole ecosystem. In the summer of 2014 within a project “Lake Erie & Lake Michigan Benthos: Cooperative Science & Monitoring Initiative,” we conducted a lake-wide survey of benthic community using traditional (Ponar grabs, SCUBA) and modern (underwater video) methods and are currently working on data anlysis. In 2015, we replicated the study in Lake Michigan. Data from this wide-lake survey will be compared to historical data to assess changes in the benthic community and trends in dreissenid populations that have important management implications. Reports of the 2014-2015 CSMI benthic surveys in Lake Erie and Lake Michigan are available on the Publications page. In 2015, in collaboration with the U.S. EPA, University of Michigan, and NOAA, we conducted the first lake-wide survey of the benthic community of Lake Michigan after the Dreissena spp. invasion. We collected and analyzed 421 PONAR samples from 143 sites located in all basins of the lake, and depths ranged from 10 to 196 m. Over 110 different macroinvertebrate taxa were found in the lake, with Chironomidae and Oligochaeta being the most diverse taxonomic groups. Read the report on the Publications page. With the assistance of EPA GLNPO and in collaboration with EPA Mid-Continent Ecology Division (Duluth), in September 2016 we collected 180 benthic samples at 60 nearshore sites in Lake Superior. 27 of these sites were previously sampled by EPA Duluth in 1994, 2000 and 2003, and the rest were chosen randomly in the nearshore zone. This effort was funded by EPA through USGS (PIs Karatayev and Burlakova). Analysis of this data will provide a better understanding of the state of nearshore Lake Superior benthic communities, and reveal trends in benthos abundance and diversity. Together with the offshore data collected by EPA Duluth, this survey will help to estimate the population status and trends in deepwater amphipod Diporeia, a major food source for commercially important species of fish in Lake Superior. 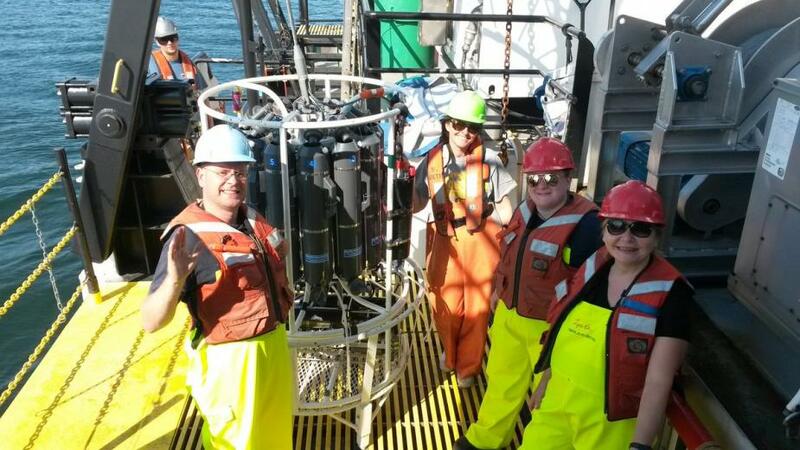 Knut Mehler, Elizabeth Hinchey-Malloy (EPA), Brianne Tulumello, and Lyuba Burlakova next to the rosette aboard the R/V Lake Guardian during the CSMI 2016. Almost every study of Dreissena in the Great Lakes has relied on bottom grabs to characterize mussel presence and biomass, but until now, the scale at which mussel cover varies has largely been unknown. In 2015, in collaboration with the U.S. EPA, University of Michigan, and NOAA, we collected 421 PONAR grab samples from 143 sites, and 429 underwater video images to estimate the spatial distribution of quagga mussels in Lake Michigan. We developed a novel method, which analyses video footage recorded from a GoPro camera on a towed benthic sled, to estimate dreissenid cover and biomass. We compared quagga mussel cover and biomass estimates based on 3 replicate PONARs vs. 500 meter long video transects. Overall, replicate PONAR samples yielded very high errors in estimates of quagga mussel presence, especially at sites with low to moderate mussel cover, because mussel cover heterogeneity typically occurs at spatial scales much larger than the sample size collected by replicate bottom grabs (0.052 m2 ). We hypothesize that, in the shallow littoral zone, quagga mussels have an abundant food supply but are limited by wave activity and therefore will form large aggregations on hard substrates, but almost no mussels will be found on soft and unconsolidated sediments, resulting in high heterogeneity in their distribution. In contrast, in the deep stable profundal zone with no wave action, mussels are food limited and will form small loose aggregations, which maximizes food consumption and results in low heterogeneity in distribution. The largest Dreissena density will therefore be observed in the intermediate depth zone, where sediment deposition is highest and wave activity does not reach the bottom. Based on these data we have made 8 presentations at various meetings and conferences and submitted a manuscript for publication in the Journal of the Great Lakes Research. In the Laurentian Great Lakes, the most severe hypoxia routinely develops in the central basin of Lake Erie, causing strong negative ecological impacts. In collaboration with scientists from University of Michigan, Purdue University, U.S. EPA, and USGS, we measured bottom dissolved oxygen using 19 high frequency data loggers distributed throughout the central basin to validate a three-dimensional hydrodynamic-ecological model simulating dissolved oxygen distribution, and compared predicted values with the distribution of Dreissena. We found that a deep, offshore hypoxic zone was formed by early August, and expanded into nearshore waters by late September, restricting Dreissena population to shallow areas of the central basin. Deeper than 20 m, where bottom hypoxia routinely develops, only young of the year mussels were found in small numbers, indicating restricted recruitment and survival of young Dreissena. Monitoring Dreissena occurrence and length-frequency distribution can be an effective tool for mapping the extent and frequency of hypoxia in freshwater. In addition, our results suggest that an anticipated decrease in the spatial extent of hypoxia resulting from nutrient management has the potential to increase the spatial extent of profundal habitat in the central basin available for Dreissena expansion. Based on these data we have made 4 presentations at various meetings and conferences and submitted a manuscript for publication in the Journal of the Great Lakes Research. Great Lakes Center researchers were awarded a grant for $835,829 by the Niagara Greenway Ecological Fund to investigate lake sturgeon habitat use, feeding ecology and benthic resource availability in the Lower Niagara River for 2014-2018 (principal investigators Alexander Karatayev, Lyubov Burlakova from Buffalo State, and Dimitry Gorsky from USFWS). The lower Niagara River provides habitat to one of the few remnant populations of lake sturgeon in the lower Great Lakes. Evidence shows that this population may be in recovery (Buffalo News), but information about sturgeon ecology in this unique system is lacking. In this project, we study the diversity, distribution and density of benthic forage resources and the biology and ecology of lake sturgeon in the lower Niagara River. We also determine lake sturgeon movement patterns, habitat use, and diet and relate it to our benthic habitat analysis to determine substrate and habitat preferences and to predict a carrying capacity for lake sturgeon in the lower Niagara River. To date, we collected over 250 benthic samples and produced a habitat map which will be the basis for future habitat restoration projects in the river. 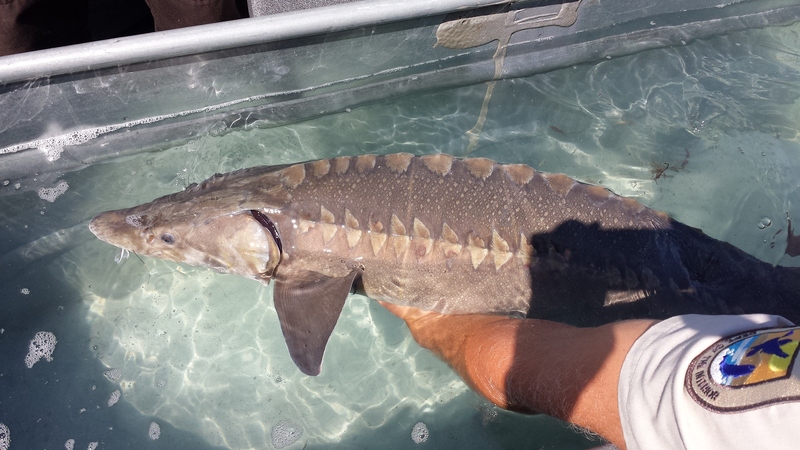 Our study produced an assessment of food availability and habitat preferences of lake sturgeon in relation to restoration of the local population to aid researchers and managers in developing measures to protect and enhance habitat to advance lake sturgeon recovery in the lower Niagara River. The results of this work were presented at the 59th and 60th IAGLR meetings in 2016 and 2017. Emerald shiners (Notropis atherinoides) are small fish that constitute the base of the food web that supports many sport fish and fishing birds in the river. They are particularly important in the diet of the common tern, a threatened species in this area, and contribute significantly to their chick-rearing success. Despite their abundance and importance in the food web, we know very little about the movements of the emerald shiners in and out of the river into Lake Erie. However, observational accounts report that while the adults move into the river in the spawning season, juveniles and larvae swim upstream back into Lake Erie. Unfortunately, the river shoreline has suffered multiple transformations; riprap and bulkheads dominate most of the areas that in a natural river would have slower currents. The concern is that the emerald shiners, and especially their juveniles, may have a difficult time completing their annual migration cycles. A collapse in this species would have negative repercussions to their predators, sport fish and birds that depend on this resource. The impact would be felt by the public as well: sport fishermen and bird-watchers, naturelovers and river users. To address the complexity of this project, we collaborated with scientists from the NYS DEC, US Army Corps of Engineers, and Buffalo Niagara Riverkeeper. 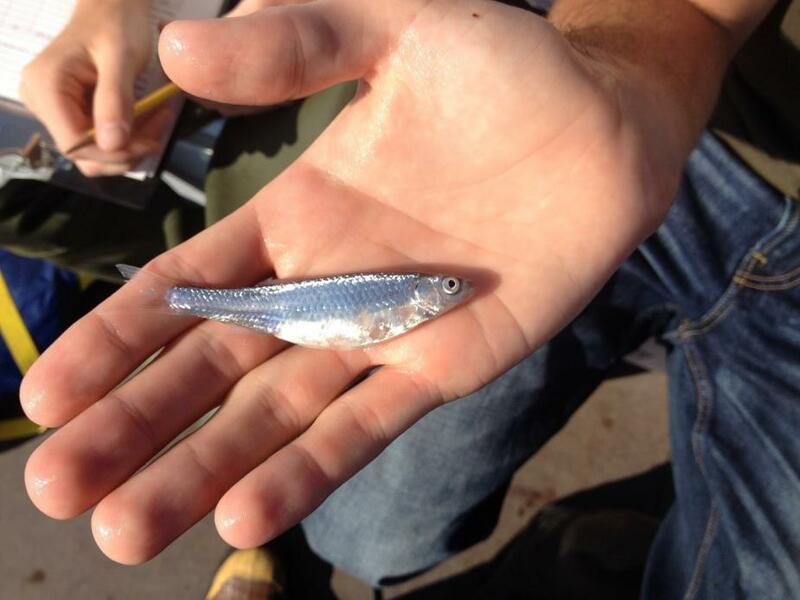 In this project, we study the emerald shiner’s use of the upper Niagara River for spawning, nursery habitat, pathways of migration and year-class formation. Results from habitat use by the shiner will be used to determine restoration needs to provide enhanced spawning and nursery areas and to diminish impediments to fish movement in the river, such as high water velocity areas from altered river shorelines (bulkheads, pilings, etc.). We are also studying food availability to larval, young-of-the-year and adult shiners as well as their contribution to the diets of sport fish, adult common terns and their offspring. Our focus is to determine critical habitat for the shiners reproduction and migration, and to evaluate the influence that these fish have on local sport fish and on the brood success of the common tern. Our results will answer questions about habitat conservation, restoration or possible modification to ensure the long-term success of emerald shiners, sport fish, and common terns in the system. Visit the project website for new updates and links to social media. Graduate student Jo Johnson seining for emerald shiners. The Western New York Partnership for Regional Invasive Species Management (WNY PRISM) continues to identify, map, and develop management plans to control aquatic and terrestrial invasive species in the eight western-most counties of New York. The office hires several seasonal crew members each summer to aide in its management and restoration efforts, in addition to employing a full-time Coordinator and Project Manager. The office coordinates management activities and public outreach efforts among a wide diversity of partners in the region, including NGO’s, state and federal agencies, and academic institutions. More information about WNY PRISM and its activities can be found on its website http://www.wnyprism.org/. Researchers at the GLC are documenting the seasonal population density, size distribution, and nutrient content of round gobies in the nearshore of western Lake Ontario, as well as the lower Niagara River, to understand cues related to their offshore and inshore annual migration. The benthic invader departs the nearshore in later fall, moving off to deeper waters in excess of 100 m over a period of a few weeks, and returns in the spring over a longer period. The project is addressing the contribution of this offshore migration to the offshore nutrient budget by comparing the population density, size distribution, and nutrient mass in the migrating and returning goby population. We are collecting and analyzing samples at different trophic levels to determine the prevalence of contaminants in the Niagara River’s fish and wildlife, in particular those that contain halogenated compounds with a tendency to bioaccumulate. These contaminants are analyzed in water collected near wastewater treatment plants’ outflow into the river and in predatory fish and avian and mammal wildlife. In particular, we are focusing on pharmaceuticals that enter the river routinely and may affect animal behavior. Our focus will include one of the most commonly prescribed antidepressants, selective serotonin reuptake inhibitors (SSRIs), which may cause impairments in fish and wildlife. Since 2008, the Great Lakes Center has monitored two sites in eastern Lake Erie for the Lower Trophic Level Assessment, a multiagency effort begun in 1999 by the Forage Task Group of the Great Lakes Fisheries Commission. 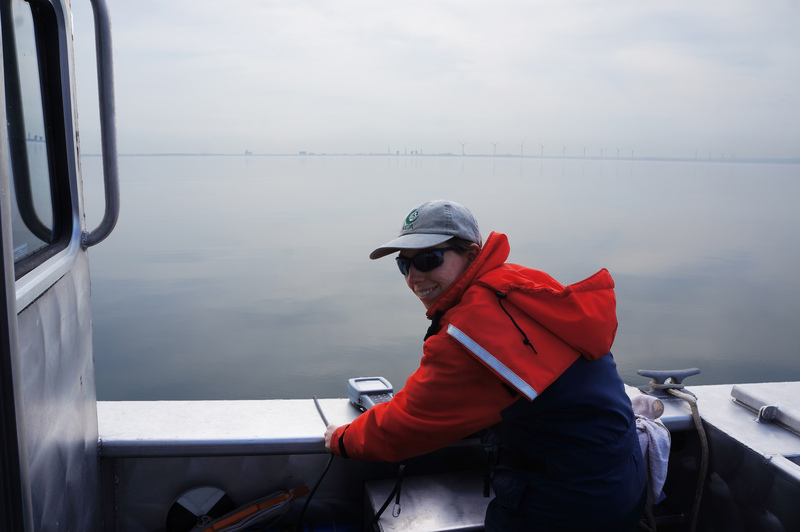 This long-term project coordinates the efforts of state and federal agencies at sampling stations throughout Lake Erie to build a database of biotic and abiotic information and describe annual trophic conditions. From May through October we collect physical limnology data, water samples, and plankton samples biweekly, and take benthic samples three times a year. A poster from this project was presented at the 13th Annual Faculty/Staff Research and Creativity Fall Forum in Fall 2012. Since the summer of 2011, we have deployed an automatic buoy provided by GLOS (Great Lakes Observation System) into Lake Erie. The buoy is maintained and run through the Great Lakes Center as a part of a regionally distributed network of 19 fixed monitoring buoys that are located throughout the five Great Lakes. The buoy is one of six standard GLOS buoys and the only one located in the Eastern basin of Lake Erie. The GLOS buoy is deployed 5 miles NNW of Dunkirk in 30 meters of water. The buoy is 16 feet in length, 4 feet in diameter and weighs a little over 650lbs. It collects meteorological information including solar radiation, barometric pressure, wind speed and direction, and relative humidity, as well as wave height, direction and period information. The buoy also measures water temperature from the surface to 20m in depth, and dissolved oxygen and conductivity at 20m.  Data collected are logged and transmitted via a cellular link back to the Great Lakes Center. The information collected from this buoy and from the whole GLOS system can be used for climate modeling, lake current and energy budget modeling, as well as being useful for the study of nutrient dynamics and fisheries. The system is also useful for commercial and recreational navigation by providing real time information regarding wind and wave conditions. In the summer of 2012, buoy evidence was used to help explain a fish kill.